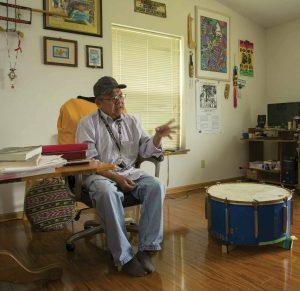 "Word Collector" Ray Young Bear '73 writes poetry and novels in a language he mistrusts in order to preserve the culture that he loves. Algonquian is the group of Native American languages—and cultures—to which Meskwaki belongs. The Meskwaki, or “People of the Red Earth,” originated in the Great Lakes region of what is now New York and have a long, tragic history of being driven westward, all the way to Kansas. Finally, in the 1800s, they doubled back to central Iowa, bought a chunk of prairie beside the Iowa River and took root there in what is now the Meskwaki Settlement. Indeed, the two languages flow together in many of his recent poems. Lines of Meskwaki appear here and there among his verses, and his newest volume—Manifestation Wolverine: The Collected Poetry of Ray Young Bear, a compilation of his earlier collections plus a slate of new poems—includes works like “Three Translated Poems for October,” originally composed in Meskwaki and then translated into English, as well as a series of old Meskwaki peyote and social songs. that it would be her. The slightly worn La-Z-Boy recliner in Young Bear’s living room appears in some of his poems as a place of visions. It’s where he sits when he’s seeking spiritual guidance, and a number of his poems originated in scenes dreamt there. Today, however, he has ceded that place of honor to his guest and retreated to a desk chair against the wall, where he sits gazing out at the riot of springtime greenery as he talks about his life and the culture and religion that inspire much of his poetry. On the wall behind him are framed photos of his six adopted children, along with concert posters, Meskwaki artifacts and memorabilia from poetry readings across the country. To his left is a big ceremonial drum, on which he occasionally taps out a rhythm to illustrate a story. in the snow begin somewhere. out. its legs over each corner. the yellow blanket in her sleep. and sees what is ahead of us. without a house, without roomlight. and its people cover her. the clothes she wears cover her. the skin of her body covers her. the bones cover her womb. and dies in our place. The answer would come to him through popular songs sung by the Beatles and Simon and Garfunkel. He recalls becoming so fascinated by the lyrics of “The Sound of Silence” that he wrote them down on a piece of paper and carried them around in his billfold. Soon Young Bear would begin to write more intentionally, and poetry would shape his life in surprising ways. For example, it was a poem that brought him halfway across the continent to Pomona College. It sounded too good to pass up, so he took the ticket the College sent him, and with $25 in his pocket and a paper bag full of snacks, he boarded the train for a two-day trip out West. At Pomona, he soon found himself in over his head academically—some classes he thrived in; others he found utterly incomprehensible. Today he suspects that he underestimated his own academic abilities and sabotaged his own college career. In any case, after two years of focusing on the classes he loved and ignoring the others, he dropped out and returned home. But he still remembers those two years as some of the most influential on his poetry, mainly because of the poets he encountered on the Pomona campus. After Pomona, he became a college hopper, spending time at the University of Iowa, Grinnell College, Northern Iowa University and Iowa State University, taking what he wanted from each while resisting requirements that would have led to a degree. Since then I was nobody. Since then I was alone. diving to make land available. came the rest of us. Ironically, it was his traditional grandmother who encouraged him to continue to develop his burgeoning talent with the English language. Much like a scrap metal artist, he says, he collects verbal scraps and reassembles them into art. To some, that may sound metaphorical, but Young Bear couldn’t be more literal. Indeed, in recent years, he has become more and more involved in trying to use his ability to channel those spiritual connections for more mundane purposes, like solving crimes. Thirty-two years of age I am. by the cold rain and wind. You know I like to fish. A few years later, after watching the news about three missing campers in Yosemite Park, he fell asleep in his La-Z-Boy and dreamt that he was one of the women, talking to a mysterious character through a car window. He took note of the license plate on a nearby car, but forgot it upon waking. The next day, he returned to his La-Z-Boy for a vision quest. “I was able to pin the license down and forward the info to the Sacramento FBI,” he recalls, though he has no idea if anyone ever took him seriously. 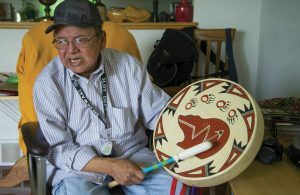 Maybe it was inevitable that Young Bear, caught from an early age in the tug-of-war between the traditional and the progressive, would be conflicted about the role of the two languages that have shaped his life as a Meskwaki and a poet. Though he continues to work on his poetry in English, as well as the third volume of his Black Eagle Child trilogy, he is also hard at work on a volume of nonfiction—a combination memoir and Meskwaki history. 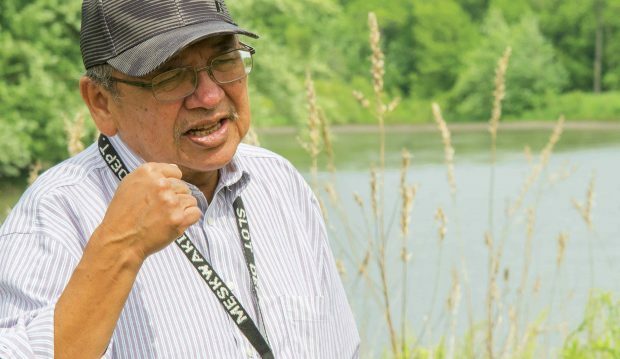 More and more, he is convinced that the true value of his work will be in whatever power it has to help preserve Meskwaki culture, religion and language. “Culturally, with tribal languages predicted to die, poetry might be the vehicle against linguistic atrophy,” he muses. Still, the poet who refuses to think of himself as a poet continues to caution himself against taking his own literary ambitions too seriously.